The phrase, from ancient text, “where two or more are gathered” can meet for a multitude of reasons. Among them, is to reach out beyond ourselves so we might grow our soul and serve the world. As a small congregation, our outreach happens in two’s and three’s for a couple of important reasons. There is a plethora of opportunities to serve the world and whenever someone feels the call to get involved, they do it. These programs spring up when someone invites others to join them and an outreach program is born at our church. Often the motivation comes from one, or more, of our Principles. Earth Day Festival– We plan and hold the annual Texoma Earth Day Festival each April. The festival includes a key note address, workshops, children’s activities, a trash fashion show, student art show, vendors, and recycling. The Earth Day Planning Committee is made up of both members of Red River UU and community leaders from other congregations and organizations. We partner with more than 40 sponsoring businesses and organizations to create the festival. Most of the sponsorships were in the form of in-kind donations. Both the Friends of the Sherman Public Library and Austin College’s Green Serve schedule their coordinating events around the Texoma Earth Day Festival. Dinners at the Grayson County Shelter– Several local congregations regularly rotate in providing a supper for current shelter residents. Red River UU’s commitment is once a quarter. The Shelter Crew, a group of about 15 volunteers, create a menu, divide up the work, and each prepares (or purchases) a dish. Some then stay and have dinner with shelter residents. 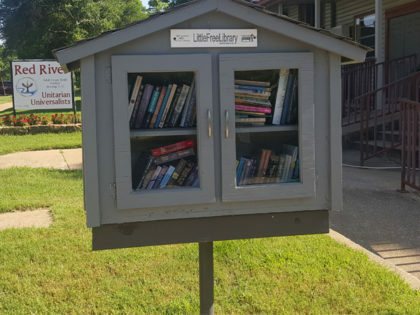 The Little Free Library – Now in its fourth year, the library actively serves the community. Two or three people regularly stock the library from books members of the congregation donate to the church. The efforts currently are spotty, however, with times the library is only sparsely stocked. G.O.T.V.– Volunteers staff a table at community events to get people to register to vote. The congregation received a small UUA grant ($229), made two large banners, and has held four or five Get-Out-the-Vote drives. While that may seem puny, the banners have been lent to several other organizations, which have found the banners a real help in recruiting potential registered voters. Annual Fan Drive– This activity is now in its fourth year. Each spring, a local radio station holds an area-wide fan drive for those without a/c. When someone takes the lead, the congregation collects between 18-20 fans and delivers them to the radio station. Tx UU Justice Ministry– The congregation voted to become a member of TXUUJM when it first was created, and annually contributes $2/member each October. One or two members of the congregation are on their advisory board. LGBTQ+ MeetUp– The current LGBTQ Welcoming Committee has hosted two MeetUp events, which are open to all LGBTQ individuals and allies. Grayson County NAACP– The congregation holds a life-time membership in the chapter, but has rarely been involved in any of its work. Some years we have purchased a table for their annual youth scholarship dinner, held at Austin College.